Restaurants in and around Sutter Creek rival the finest eateries in the state of California. Each Sutter Creek restaurant has its own unique flavor and ambiance. From fine candlelit Italian cuisine to an ice cream emporium to a shotgun-shaped hangout with 1940s memorabilia, the character of Sutter Creek’s historic culture is prevalent through its various dining experiences. Fine dining exists, and may be accentuated by limiting seats to 20 patrons in an old home setting or on a patio overlooking beautiful gardens. 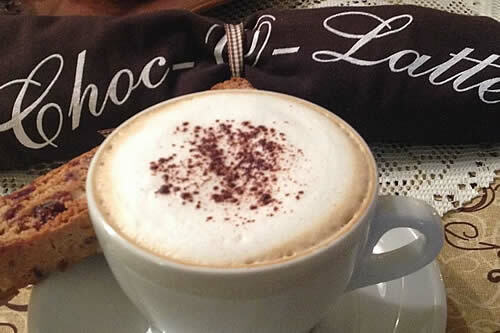 Coffee house serving homemade pastries reflecting the local flavors defined by patrons, not by corporate suits. Cafes serve up sandwiches and snacks, where high-tech operations have not yet invaded the proprietor’s establishment. Buffalo Chips Emporium Restaurant. Open Wed-Sun. Open for Breakfast and Lunch. We have Pies and Ice Cream. Friday and Saturday night Burger Bash. We pride ourselves on fresh, farm-to-fork quality comfort food and a family-friendly atmosphere that’s sure to feel like home! We specialize in sandwiches, burgers, salads, soups, and desserts, and boast a full bar offering an array of specialty cocktails, wine, and beer. Specialty coffee and chocolates. We also have free WiFi. So, sit at a table and get a little work done while you enjoy an afternoon boost! Located at the Hanford House Inn and open to the public 6 mornings per week. 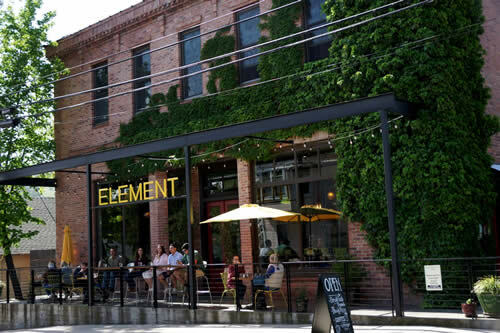 Tucked into the heart of Amador County, Sutter Creek’s Element restaurant offers cultured and creative breakfast and brunch dishes. Finding the delicate balance between innovation and recognizable comfort, items such as the Hanford House Benny featuring house made citrus hollandaise sauce and soppressata are part of a unique breakfast experience. The restaurant has a lively and casual atmosphere, patrons enjoy our full spirit and espresso bar and dining on the patio. Join us to celebrate food, friends, family, and community. Hours M-Sunday 8 a.m. to 1 p.m. (Excludes Tuesday). Suppers at Element every 3rd Friday of the month 5-9 pm. Seasonal supper menu; wine as well as a full spirit & expresso bar. When you choose Hotel Sutter, you don’t have to go very far for delicious food and exciting nightlife. Our on-site restaurant serves fresh, farmhouse flavors 7 days a week. All produce and meat is sourced locally and sustainably for a truly unique dining experience. Join us for lunch, dinner and Sunday brunch. Sunday thru Thursday: 11:00 a.m. to 9:00 p.m.
Tuesday: 5 p.m. to 8 p.m.
Thursday: 5 p.m. t0 close. Friday & Saturday: 5:00 p.m. to 2:00 a.m. 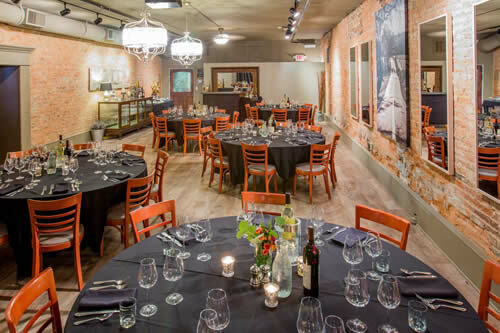 Dating from 1879, the historic Imperial Hotel in Amador City offers casual elegance in indoor and patio dining to visitors and local residents alike. The beautiful dining room has original brick walls graced with the serene paintings of artist Sylvia Susan (sylviasussman.com) This family-owned and operated establishment takes pride in featuring organic, locally grown produce, fresh meats and sustainably harvested fish and seafood. The menu varies with the seasons and honors the simple goodness of the ingredients in the tradition of the finest California cuisine. The Oasis Bar at the Imperial Hotel is an experience in itself with its antique barstools, old gaslights and creaky floorboards. 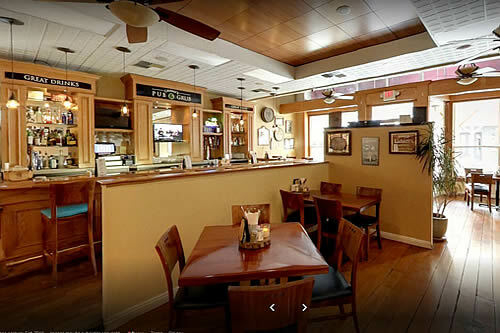 The bar is stocked with a large selection of spirits and California and imported wines and beers. The wine list features a careful selection of award-winning local wines. Happy Hour on Wednesdays from 5 – 6:30 pm, a mix of locals and tourists enjoying hors d’oeuvres and camaraderie … in the Oasis Bar. A 4 1/2 Star restaurant for casual dining! Fresh homemade pizza, calzones, salads and the most amazing bread sticks! 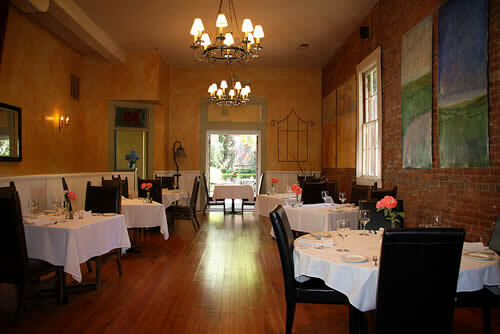 Gold Dust Pizza offers covered dining in the front, cozy dining inside and dining by the creek. Open everyday from 11am to 8pm. Established in 2011. This store was the second location for Bob and Monica Willey. Their first store was started in 1984 in Ripon CA. Their store in Ripon is named Pizza Plus. They originally wanted to name the Sutter Creek location Gold Dust but at the last minute changed their minds. In 2015 they open their third store in Oakdale and named it Gold Dust Pizza. They themed it to match their Sutter Creek location. 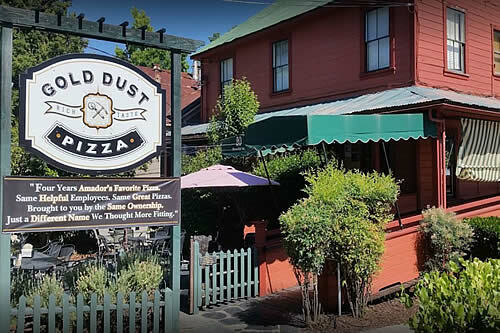 After much debate they decided to change the name in Sutter Creek to Gold Dust Pizza as well. They both love the area, the history and the amazing people they have meet there. 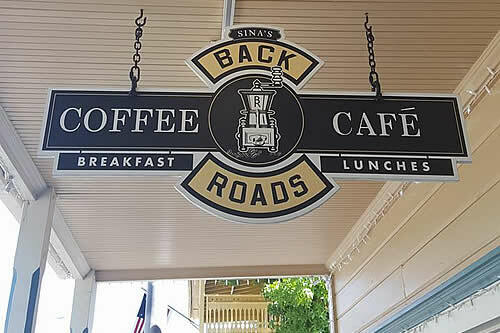 Welcome to Sina’s Backroads Café where every dish is made fresh and sweet treats are a homemade specialty. We have a firm belief that a homecooked meal doesn’t have to be made at home. We have our all-time favorites dishes and seasons goodies that kick off special times of the year..
Full breakfast served all day and wonderful homemade sandwiches, soups, and salads. Freshly baked cookies, pies, quiche, and more. If you find yourself in Sutter Creek California don’t forget to come by and say “Hi” and maybe even grab a snack. Our menu strives to match the taste buds of everyone as our food reminds you that it is sometimes nice just to sit back, relax and enjoy the homemade goodness. Monday, Tuesday & Friday 7:30 to 3:30pm. Saturday & Sunday 7:30 to 4pm. 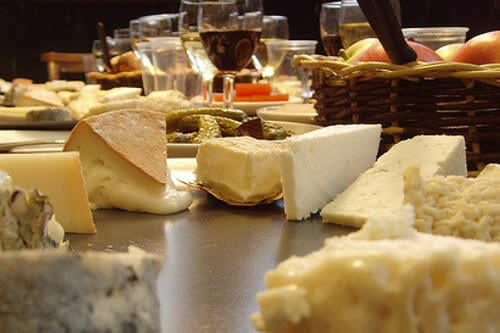 Specialty foods include specialty crackers, salami, olives, homemade jams, gold country honey, cured meats, heirloom beans and delicious chocolates. Samples are our signature. Open 7 days-a-week from 10:00am until 5:00pm. 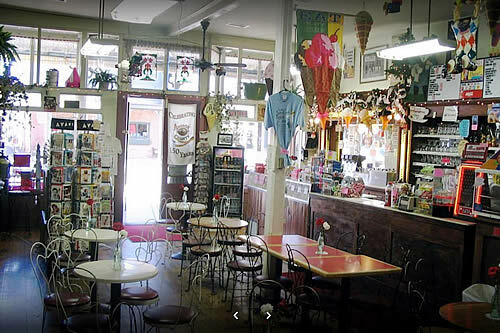 Step back in time to the turn of the century as you walk through the doors of the Sutter Creek Ice Cream Emporium. 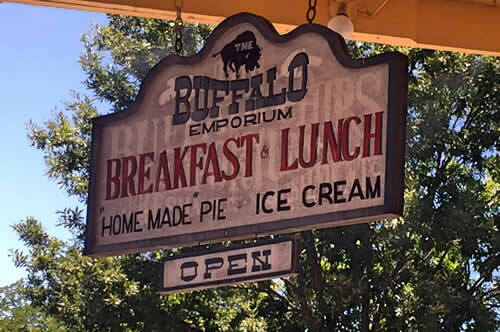 Once the town drug store for over 70 years, it now houses an old -fashioned ice cream emporium with a broad selection of old-fashioned candies, fresh-made fudge, a full lunch menu, great gifts and, of course, great tasting ice cream treats.Open 7 days a week from 11 am- 5pm.